Happy Furry New Year! A look back and what’s coming soon from Patch and Fred Patten. 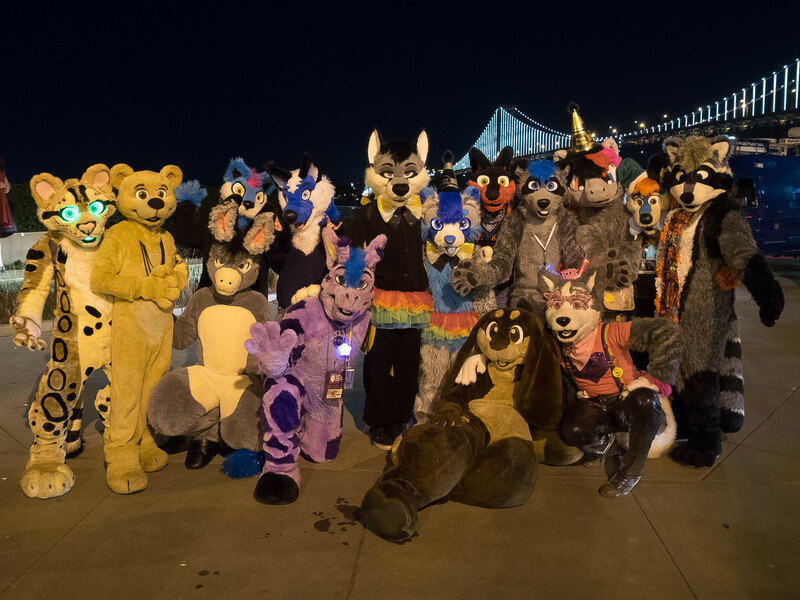 Furry New Year from Spottacus, Majik, Maczyn, Dakota, Bakr, Cassie, Stormy, Relaxing Dragon, Cyclone, Scoob, Chairo, Trail Horse, Zarafa, Kalu, Patch, and all the Bay Area Furries. (Pic by Amenophis.) At the San Francisco Bay Bridge, the crowd was super excited to hang out with us before the fireworks. It was a great year, and it’s a huge honor to host Fred Patten’s articles. The top article of 2014 was about November’s “Wild Things” party (NSFW), with 7,000 views. The second was about John Waters and furries. Third was about a photo art gallery show. It’s interesting that these three involved local, live events in San Francisco. Fourth top article was Talking with the directors of College Humor’s “Furry Force” – associated with a many-millions-viewed Youtube animation that I submitted to the Ursa Majors recommended anthropomorphics list. My favorite article of 2014 is really a series, about San Francisco’s Frolic party. It was a big job to transcribe an audio interview and lay out five parts. It covered 90 minutes talk with founder Neonbunny. I liked showing behind the scenes of a huge influence on what makes Furry subculture an amazing social experience. Fred’s articles arrived due to Flayrah going dormant. There’s no intention to steal traffic- it just seems like Flayrah’s editors got busy with other things (for now?) Big hugs to all from there- Greenreaper, Crossie, Rakuen, Dronon, Mwalimu, Sonious and the rest are unconditionally welcome to post or submit. 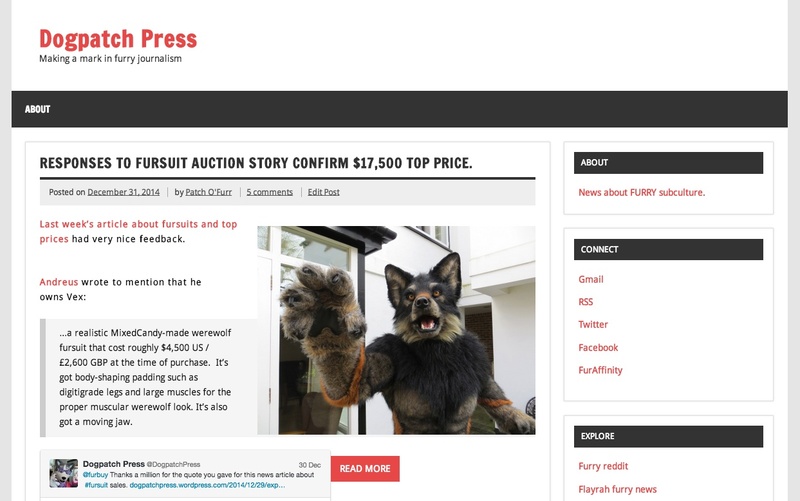 Fred needed an outlet, and this appears to be the most regular “furry news” blog at the moment. His steady submissions encourage a goal to keep bringing 3 or more posts a week. I hope his articles will influence mine for the better. Fred’s writing is also hosted at Cartoon Research by Jerry, who used to balance Cartoon Brew‘s opinionated side when that was run by a team of two. Management here is very minimal, only supporting Fred to post what he wants. What do you think about changing WordPress themes? Sidebar links. Social links are way at the bottom. I might like a more defined sidebar area to showcase special article series. Article categories, and comment count could be displayed up front. Here’s a few alternate choices. They would not display the cool header art by Spalding. Is it better to stick with “less is more?” Opinions? Twentyfourteen (free). 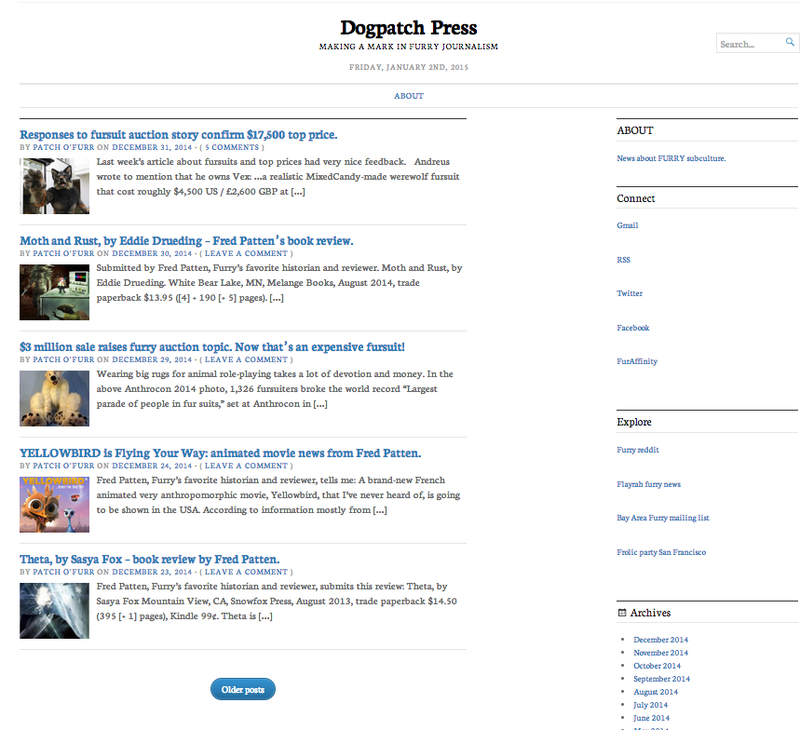 It has more features, with clean display in two sidebars- is one sidebar better? Here’s a preview. Greyzed (free). A very eye catching look, but is it too busy? Here’s a preview. Dynamic News (paid). Compare it to Twentyfourteen- is it cleaner to read with one sidebar? Here’s a preview. Broadsheet (paid). It consolidates everything to easily scan, de-emphasizing images. Too plain? Preview that doesn’t show more footer links. New special article series: FURRY GOOD IDEA. FURRY GOOD IDEA: Fursuit of the Year award and fashion show. Fursuiting inspiration: Patch’s partial style and accessories tips. 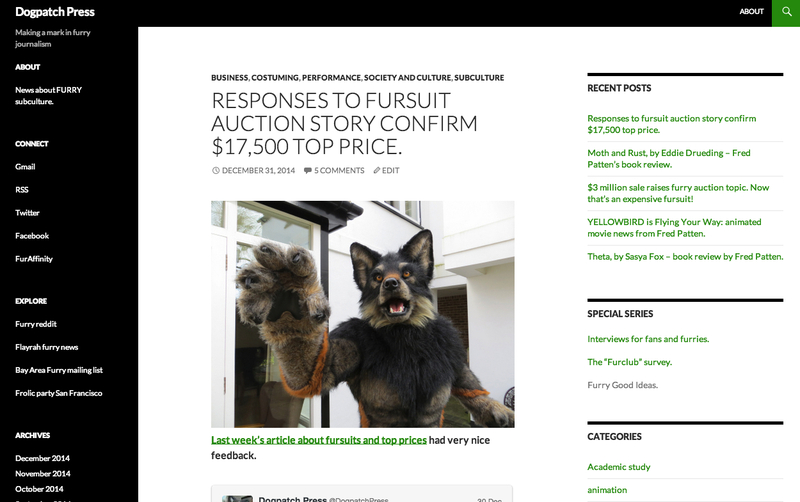 “Top Furry Media″ charts, and a positive trend of “Fursploitation” raised by reader comment. 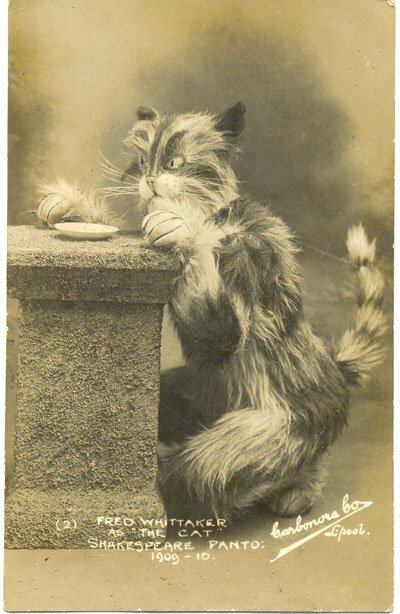 Pantomime theater “Panto-Animals” would be a prime exhibit at the Museum of Furry. “Furry bank heist” is a movie story waiting to happen- Beware of costumed bandits. History of Furry Fandom: BBS recovery project. Meret Oppenheim’s fur-lined teacup: fetish as surreal art statement. Let’s see some Furry Tattoo Art. USAGI YOJIMBO movie director interview. Fashion, fursuiting, and the meaning of it all. 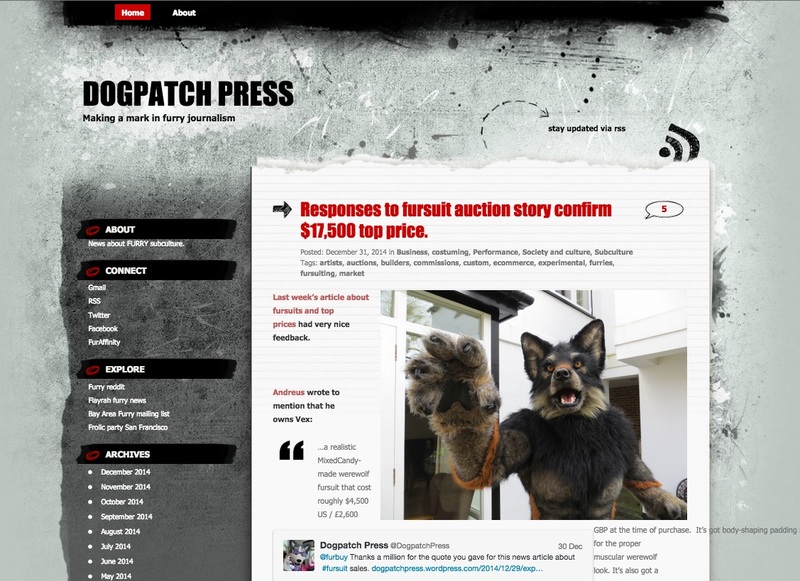 The History of Furry Publishing. French Anthropomorphic Animal Animated Features, part 1. The 2014 Olympics Winter Games Mascots. Review: L’Epée d’Ardenois. T. 3. Are there any topics you want to see covered?